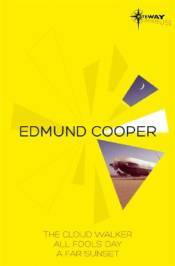 From the SF Gateway, the most comprehensive digital library of classic SFF titles ever assembled, comes an ideal sample introduction to the fantastic work of Edmund Cooper. A respected critic and writer, whose work spanned four decades, Cooper began publishing SF in the 1950s and often portrayed a bleaker view of the future than many of his contemporaries. Cooper's works tended to depict unconventional heroes facing unfamiliar and remote environments - often in post-apocalyptic settings. This omnibus contains three titles that have been out of print for many years: THE CLOUD WALKER; ALL FOOLS' DAY and A FAR SUNSET.